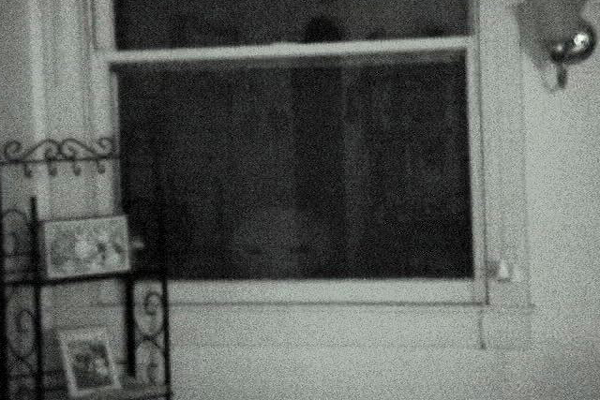 Photo: Alien in my window! I was walking into my study the other day when I was shocked to see the image of an alien head outlined in the window! If you look closely, there's the hint of two eyes within the shadow, too. Something must be done about these alien "Peeping toms!" Back in 1978 (yes, that long ago), I began publishing a ufozine. (That's a newsletter about UFOs privately published by an individual.) At its height, my Swamp Gas Journal was being mailed (i.e. snailmailed) to about 100 people and organizations around the world, usually with an exchange of similar zines. It was a great way to get info about the UFO scene in Canada out to fans, buffs, investigators and researchers in other countries, and receive stuff in return. It cost me paper, printing and stamps, but I recouped my expense through such exchange of info. It was estimated that there were at least 200 such ufozines worldwide in the 1960s and 1970s and into the 1980s. And then the Internet happened. By the mid-1990s, many zines were already online through dialup BBS systems. I think I may have lasted the longest of most of them. I continued printing (originally they were mimeographed, and then photocopied) and mailing The Swamp Gas Journal until its last physical issue in 1997. Then things went online into blogs and other e-vehicles. Most of the issues were lost one way or another. However, I did manage to save some of them in an electronic formal, and they had been storied on a number of ISPs' servers until those servers (such as GeoCities) went the way of the Dodo. Most issues are from the 1990s, but there's one from 1980, just to give you a taste of what has been preserved. The issues give some insight into what ufology was like about 20 years ago. And the UFO reports keep a-comin'. Just to give you a taste of what we're getting this year, here is a sampling of sightings reported across Canada recently. My wife, I, my father and step mother were on my back porch at 930 pm in Shoal Harbour, Newfoundland. We all wittnessed a glowing orange circular craft flying east to west in the sky. I waved at it and it came to a stop for about 10-15 seconds and then took off. It was about the size of an apartment buiding. I called the local police and it got even stranger. The dispatcher asked where I was and I said Clarenville. She said they just received a call saying to expect UFO calls. She said that people were at the mall using flood lights. I said thats imposible, first its not flood lights second we're too far from there. She asked again where exactly I was. I said in Shoal Harbour, about 5 km away, and behind a mountain. She then said, "Oh, there are scientists in Clarenville today using thermal imaging projectors." I said that doesnt make any sense and the call ended. My mother and I were sitting outside in her backyard... All of a sudden I seen a bright yellowish-orange light going from lower in the sky, upwards very slowly. I know it couldn't have been a plane or helicopter because it was silent, it was flying too low and because of the colour/brightness of the light. At approximately 2330h EST, I was sitting outside on the deck with my wife and saw an orange-red ball heading south from over top of our apartment building. I ran inside to grab my binoculars and by the time I got back outside, it was gone. Then at approximately 0030h EST, my wife, my neighbor and I witnessed another orange-red object cut across the sky from east to west. This was the exact same colour as the first, both travelling at a moderate speed, looking as if it was going up and fading out. At 0100h EST as I was walking my dog to the field adjacent (to the west) to our building I looked to the north and noticed another ball coming up from the horizon heading south over top of where I was standing with my dog. It was flying extremely low, approximately 10 meters from the ground. As it cruised over me, it made no sound. There was no heat emitted, it was clearly a triangular shape, illuminated by orange-red lights. The entire object was glowing. It appeared to be big enough to hold just one person. In doing some research for my upcoming speaking engagement about UFOs in Saskatchewan, I found a note by Fortean Rick Fowler about a film by the National Film Board of Canada that documents a sighting by an Aboriginal family on Ahtahkakoop, a Reserve in central Saskatchewan. The film, titled simply The Visit, was released in 2009. It features a narration by a Cree man whose entire family watched a saucer-shaped UFO for a considerable length of time one night in 1996. In the narrative, the witness eventually contacts the RCMP, and an officer does come out to interview the family. Curiously, the officer supposedly sees an unusual brightening of the sky while driving to the Reserve. Checking Ufology Research files, however, there is no record of a sighting from that location, and no RCMP record for the event. There are a number of reasons why this could be, including the possibility that the RCMP report was filed only regionally, or because after 1995, UFO reports were not officially investigated by the RCMP for the National Research Council. As the narration continues, the sighting goes in a more spiritual direction. After the officer leaves, the man decides to pray, drum and sing in response to the object, and the UFO starts flashing and brightening in reply. The Visit tells the true story of a Cree family's strange encounter one winter night, which results in a conversation beyond words. The film is just under four minutes in length. It sells for $14.95 CDN. How many government-funded films have been made about UFO sightings? Keep skygazing, Winnipeg! UFOs oot and aboot! 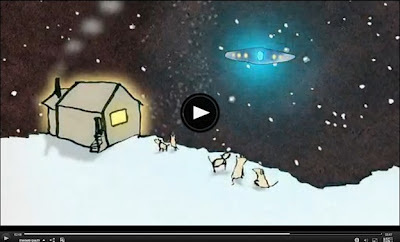 Another article about the 2011 Canadian UFO Survey appeared today in news media. Although the article was overwhelmingly pro-alien, my quotes were factual and accurate. "People do see things in the night sky they can't explain," said Chris Rutkowski, research co-ordinator for Ufology, which put together the survey. "It shows UFOs haven't gone away. It shows it wasn't a trend or a fad. People are still reporting them." "There are a whole number of factors that can explain (sightings)," said Rutkowski. "A lot of people are reporting lights on fire going across Manitoba skies." Despite this, Rutkowski said there are still 11 per cent of reports that can't be explained. "There are things up in the sky that are UFOs," he said. UFOs don't necessarily mean little green men in saucers who've come to vacation in our lovely city. They are simply phenomena in the sky we can't explain. Winnipeg may be dealing with an influx of aliens, like this one, captured in the Universal Pictures quasi-documentary "Paul." 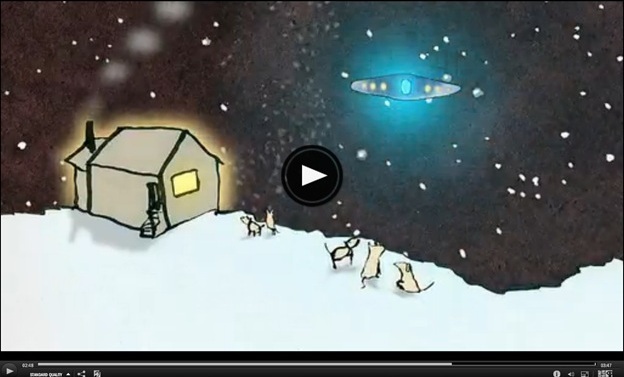 If I recall, there's another quasi-documentary about aliens and UFOs that came out some time ago. It was called "Mork and Mindy."